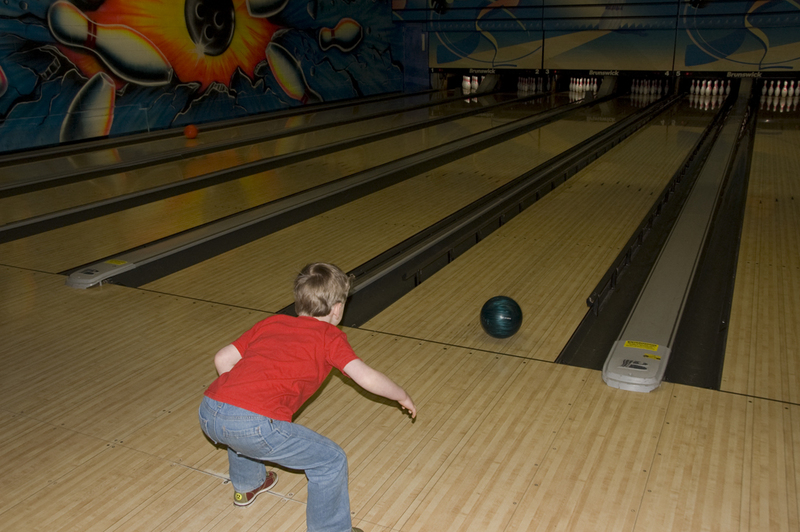 The only bowling alley in our town is on the way to some of our friends' house. Recently Cory noticed the sign and wanted to know what it was. When we told him it was bowling he decided he wanted to go and has been asking every time we drive by. We didn't tell him that Brian's school was going and we were invited... until the night before. Unfortunately he had a pretty high fever so I wasn't even sure we were going to go. But even not feeling well he was determined to go in the morning. 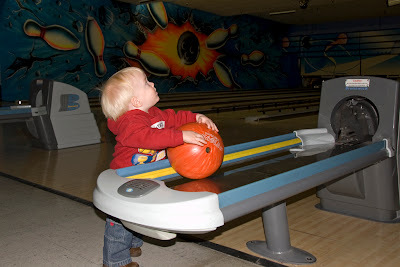 My son's first experience bowling. Complete with little boy bowling shoes! 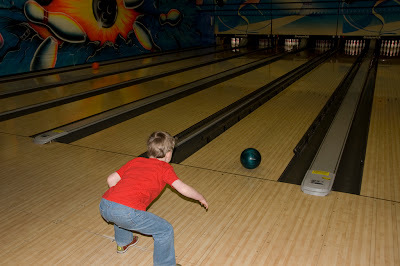 He didn't have a whole lot of umph behind the ball so Brian showed him how to Granny Bowl... and yes, I have his permission to post this picture for the public to see! 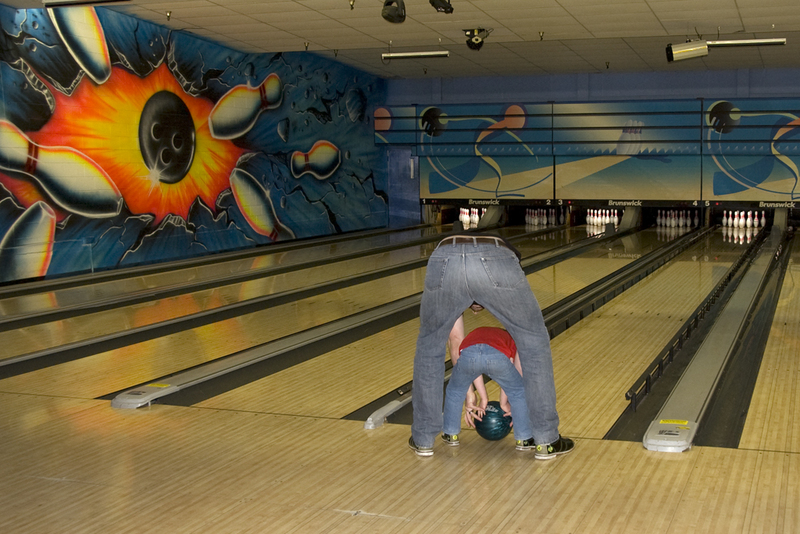 After about 3 frames Cory was done, but we convinced him that he really needed to finish the game. And a few minutes later they turned off most of the lights and turned on the black lights and disco lights. That was cool and he did enjoy it. Although when we finally go back out in the sunlight I realized my poor son really was sick and looked a bit like death warmed over. He complained that it was cold in Safeway and put himself to bed for a nap after lunch (first time ever). 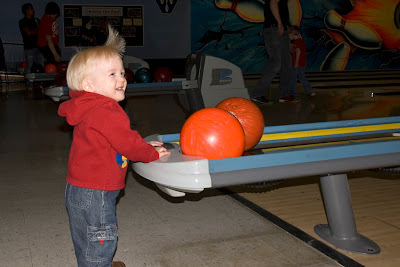 Noah on the other hand was fascinated by the very brightly colored balls in the lane next to us and kept going over to look at them. Here he's also watching the disco lights although you can't see them with the flash. Look closely and you can see he also discovered the hand dryer and it's blowing his hair. He of course was also a big hit with all the high school girls! All in all, a pretty fun excursion, but we'll be going back for free kids bowling this summer when Cory's feeling better! That last picture is just adorable! Oh no! He really isn't feeling well. I hope he's recouperating well at home. It's always fun to get to do something that you've been dreaming about...even if you've only been dreaming about it for a few weeks. ;) How fun for Cory! Although it's not very fun to get sick in the middle of it!!! Welcome to Married Life's Party!